Smart Bike Computer: LCD 5 Setting . Display the Power, Distance, Speed. 1000W 48V Brushless Motor, Hign Power. The highest speed can reach up to 50km/h(31mph). The gradeability can reach 40° in common road condition. 5 setting smart computer, which can display the battery status, speed, trip distance and modes. 48V 13AH Lithium Battery. One power can support a 40-80km trip with pedal assisted. Over 500 times recharge cycle, 6-8 hours charging time from empty to full. Both the UK and EU standard plug available for UK and EU customers. 26 Inch Aluminum Alloy Frame, Full Suspension. 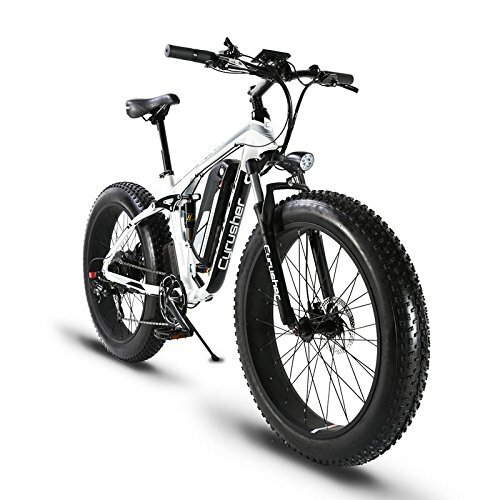 4.0 fat tyre, adapt to snow, beach, mountain ridding. Recommend rider-height : 5'6'-6'5"(165cm-190cm), max weight support 360LBS. Shimano ASL TX50 7 Speeds Shift System. Smooth and accurate shifting. Oil Hydraulic power off disc brake. All the components are set for your comfortable and safe cycling.